Sitting there, raising a glass of champagne, there was only one little shadow on my immediate horizon: my period. Where was it? A few weeks before, we had been on the usual prime ministerial weekend to Balmoral. The first year we had actually stayed - in 1998 - I had been extremely disconcerted to discover that everything of mine had been unpacked. Not only my clothes, but the entire contents of my distinctly ancient toilet bag with its range of unmentionables. This year I had been a little more circumspect and had not packed my contraceptive equipment, out of sheer embarrassment. As usual up there, it had been bitterly cold, and what with one thing and another ... but then, I thought, I can't be. I'm too old. It must be the menopause. Once back from the course, I met up with Carole [Caplin] at the gym. “I know it sounds odd,” I said, “but do you think you could get me a pregnancy testing kit?” She brought it round on the Thursday and on the Friday morning, lo and behold. I just couldn't believe it. I rang Tony immediately. That evening he came back from Chequers and as soon as there was an opportunity, I showed him the little dipper and explained the significance of the blue line. “How reliable is it?” he asked. I said I didn't know but that Carole had got me another one, though I'd have to wait to do that the following morning. Alastair and Fiona came up the next morning before we set off for Bournemouth and the conference. The second test had shown the same little blue line. “So how pregnant are you, exactly?” Alastair asked. Frankly, he was more amused than anything else. They took the view that, given it was still very early days, the best thing was to keep completely quiet. By chance, I had already agreed to come back to London on the Monday for a Breast Cancer Care event. I'd leave a little earlier than planned to see my GP. Tony insisted we tell Sally Morgan [his long-standing political adviser], who was travelling with us on the train. We couldn't just sit there and not tell her, he said. “Weird to think that when we go up to conference this time next year we'll be struggling with a pram,” she said. We ended up giggling like schoolkids. Rather than risk making a big deal of it, I went along to the general surgery at the Westminster Health Centre. It turned out that my usual doctor, Susan Rankin, wasn't there, so I saw another partner. “I think I'm pregnant,” I replied with a smile. The poor man fell to pieces. I had to calm him down. He didn't want to do an internal examination, he said. Feeling obliged to have at least a bit of a prod of my tummy, he kept saying “Susan should be doing this”. The next day it was very hard not to mention it. Traditionally we had a lunch for family and friends while Tony made the final adjustments to his speech. My half-sister Sarah, who now worked as a journalist under the name of Lauren Booth, had just had a miscarriage - she had written about it in a newspaper - so the last thing I wanted was to upset her further. I didn't tell my father for the same reason - that is, that he might have let it slip. The plan was to keep the number of people in the loop very small. Now that it was confirmed, I decided I wanted a bit of private time with the idea of this baby. Also I was conscious that, particularly at 45, things could go wrong, although I was personally convinced that everything was going to be all right. I had decided I wanted to get past the 12 to 13-week mark before extending it beyond the tight-knit group. I told my mother and my sister and Jackie, our nanny. I was a bit worried about telling the kids. I wanted them to know, but I can remember feeling, they are going to think this is disgusting. I mean, parents! But they were fantastic about it and really excited. I did, but having got this far I didn't want to risk any damage to the baby, so I decided an amniocentesis was out. I had a blood test and a scan, however, and - within the parameters of my age - all appeared well. Over the next few days, the tight-knit group appeared to be stretching. Tony told Anji [Hunter, his loyal political aide] because, he said, she would be upset if he didn't. Then he told me that he'd told Gordon. “What business can it possibly be of Gordon's?” I remonstrated. “You have to understand, Cherie. It's a very sensitive topic for him. The whole issue of my being a family man is very sensitive to him.” He was only thinking of Gordon's feelings, he said. Pregnant or not, we trundled on. At one point I went up to Liverpool to do something for Jospice. Now a worldwide hospice movement, it was started by Father Francis O'Leary, a Crosby boy born and bred. As always, I stayed with my old friend Cathy, who now had six kids, her youngest being then about 4, while her eldest was older than Euan. Exhausted from the journey, I went upstairs to one of the girls' bedrooms, where I'd be sleeping. I was sitting on the bed, trying to catch my breath, when Cathy came in with a cup of tea and I burst into tears. “What on earth is the matter?” she said. “I'm pregnant. And I'm just remembering what it's like. The chaos, the noise. How can I possibly do all this in Downing Street?” It wasn't the first time I'd had such negative thoughts. 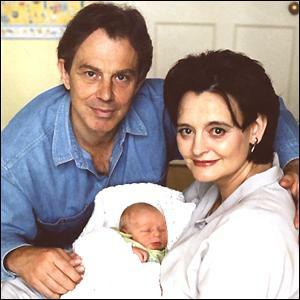 It had taken over two years, but we had just got everything organised in No 11 - the kitchen, our bathroom, the children's rooms - and now we were going to have nappies and we were going to have sleepless nights. Sitting there, I was overwhelmed by the enormity of it all. And at the same time, I thought, How dare I? Here was Cathy struggling to make ends meet. Her husband had just lost his job, she was doing part-time teaching and there she was, a good Catholic mother, bringing up these lovely, happy children. One afternoon in mid-November, I had a call from Fiona [Millar, Alastair Campbell's partner and Cherie's personal adviser]. “No. She doesn't know. I didn't tell her.” And anyway, I knew my half-sister would never betray me, not over a thing like that. I went through everybody in my head. Sally Morgan wouldn't do it, nor Anji, even though I hadn't wanted her to know. I was sure it couldn't have come from the hospital. The scan had been registered under a different name and they hadn't put me on the computer. There was always Gordon, but what could he possibly have to gain by telling the Daily Mirror? This suited Alastair because, if Piers Morgan did get a scoop, the other papers would be furious. For Alastair, dealing with the tabloids was like juggling with raw eggs. “We'll have a quote from Tony and a quote from you,” he said, and put the phone down. On the way to the meeting, Fiona's mobile rang. It was Rebekah Wade, then deputy editor of The Sun. “The announcement must be out - you might as well talk to her,” Fiona mouthed. I took the phone. I'd known Rebekah for some time and had a certain amount of respect for her: a woman making her way in the male world of Fleet Street. We had a girly chat, along the usual girly, just-pregnant lines, and that was that. The next morning, this intimate girly conversation was plastered all over The Sun. From being a Mirror exclusive, it had become a Sun exclusive and Piers Morgan was furious. To this day he remains convinced that I spoke to The Sun deliberately to thwart him. What I certainly didn't know when I talked to Rebekah was that, at the time Fiona handed me the phone, the news had not gone out on PA. It did go out eventually that night, but not till later. Though I have my suspicions about how The Sun found out, they have never been confirmed. Piers never forgave me for spoiling his party and, over the years, his resentment turned into outright hatred. From then on Cherie and the pregnancy were everywhere. The [general media] coverage was so positive that we heard there were some in the Brown camp who thought we'd done it deliberately, to undermine Gordon. I had been expecting the baby to come early - none of my other three having made 40 weeks - and towards the end I was sleeping badly. I would get up, leaving Tony in bed, and go next door into what would become the nursery, and sit in a rocking chair we had just bought. There, with the lights off, I would rock gently, looking out of the window where, clearly, at the back of the building I could see a photographer from the Daily Mail, outside the back gate, waiting. They came in shifts. Day in, day out, for three weeks. I had this horror that I would go into labour and this photographer would burst in and take pictures. Since the beginning, the Mail had been at the forefront of every negative story going. If an unflattering photograph came their way, they would print it. It was like a vendetta. The baby was due on May 23, but on the morning of the 19th I knew that labour had started. My other children were all fairly quiet births but, my goodness, I made up for that with Leo! I remember the nursing staff saying how I didn't have to worry about how much noise I made because the room was soundproofed. Only later did I realise that the room wasn't that soundproof at all. At about 8, Tony said he couldn't wait any longer and came over. The detectives all put their heads round the door to say hello, and every one of them looked as if he was going to be sick. Leo was born just after midnight. His was by far the longest of my four births and I think that part of me was holding on because I was still terrified of being photographed. It was stupid really, but when you're pregnant you do get these fixations and I just thought, I do not want to be photographed looking like that. Giving birth is very private. You think you're very ugly and that the whole thing is horrendous. You think, I don't want my husband to see me like this, let alone the entire world. In the end, of course, you don't give a damn.